I hate sitting still. And spending 12 hours on a bus in one day is not fun for anyone. But that was far from my mind when I signed up for the Northeast bus to New York City to join the Coalition of Immokalee Workers (CIW) in their “Time’s Up Wendy’s March” on March 15th. As a freshman in college, I was drawn to groups that seemed to make a difference in the world through creative and practical strategies. 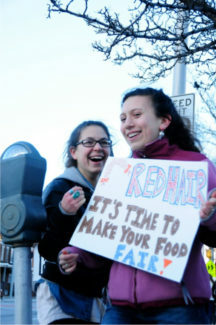 The Real Food Challenge (RFC) was one such group — a movement of students nationwide working to shift the purchasing of food in university dining halls towards more sustainable and fair sources. Which is how I found myself shivering on a cold day in March outside a Wendy’s fast food restaurant in Baltimore, Maryland at my first boycott. Our weekend-long RFC training was focused on student power and building campaigns at our schools, and rooted the work in systemic problems, connecting our purpose to that of our allies and partners, such as the CIW. I learned about the mistreatment of farmworkers, and the deep organizing that had been done for generations to create initiatives like the Fair Food Program, calling for fair wages and humane working conditions. At the same training in Baltimore I met and marched with another Hannah. She and I stayed in touch, each organizing at our respective campuses in New England, and intersecting in the world of food justice. 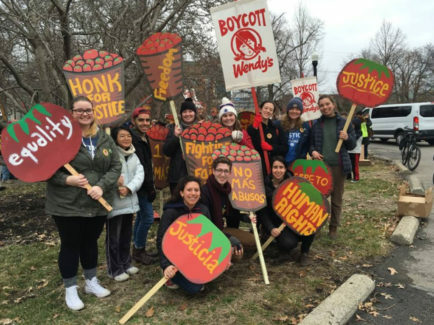 Years later as a senior, we marched together again, this time in Columbus, Ohio, with the same purpose — “Boycott Wendy’s”. I was working on growing the real food movement and organizing students to attend actions with allies, and Hannah was applying to the JOIN for Justice Jewish Organizing Fellowship program. All of a sudden it’s 2018 and I’ve been here before, but I’m not glad about it. Standing among beautiful, bright, yellow banners, surrounded by masses of people from different walks of life, chanting the refrain that speaks for itself: “Boycott Wendy’s”. 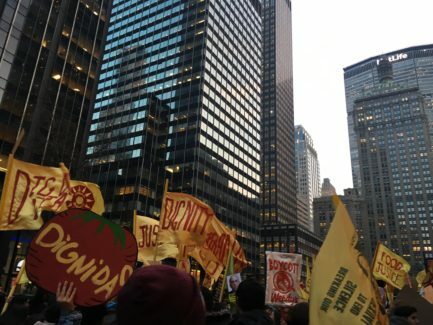 This time, a five day fast culminated in 2,000 farmworkers and their allies marching down the streets of Manhattan. This time specifically targeting Nelson Peltz, the decision makers and shareholder for the company. 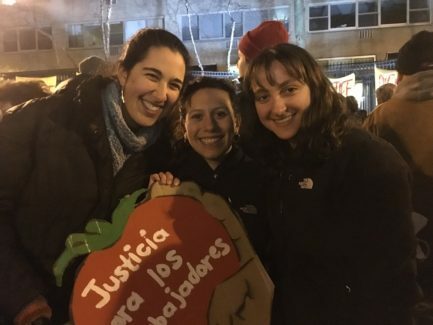 I march as a current JOIN Fellow, alongside JOIN alumni, and watch as one of our JOIN trainers, Rabbi Toba Spitzer, stands at a podium with other faith-leaders supporting the farmworkers. In that moment I marveled at the many ways JOIN has intersected parts of my life, both intentionally and unintentionally, reflecting the deep community of relationships it fosters. There is a lot to learn about power and hope from the incredible organizing that the CIW has done over the years. One of the central things I have internalized from their work is how to be a good ally. I don’t want to ever have to chant “Boycott Wendy’s” again, but if the CIW asks me to, I will. Hannah Silverfine is a current JOIN Organizing Fellow living in Somerville, MA. This entry was posted in Alumni At Large. Bookmark the permalink.